Luosto is one of our most popular destinations, and it’s easy to see why. Just 90 minutes from the boundary of the Arctic Circle, it’s well within the centre of Finnish Lapland – the country’s northernmost region which is an outdoor playground coloured by the traditions of the native Sami people who have inhabited it for thousands of years. The little village of Luosto is right inside the Aurora Zone, meaning that you’ve got a good chance of seeing the Northern Lights. Luosto functions as a picturesque ski resort on the border with the grand Pyhä-Luosto National Park: sprawling snowy hills and swathes of forest lined with simple and accessible hiking paths. Here you’ll also find the natural treasure that is Lampivaara Amethyst Mine: a geological gem filled with precious stones two billion years in the making! After spending a day skiing in the wilderness, exploring the mines, or snowmobiling around the area, you can return to the comfort of the Luosto log cabins, each of which comes with a private sauna – wind down in style! The great thing about our Luosto holidays is that there’s plenty of choice. We have special ‘design your own’ trips where you can create your ideal itinerary and look forward to Finland as you fancy it. There are also multi-activity holidays which provide your family with a full selection of classic Nordic things to do, so you won’t feel like you’re missing out. Whichever you go for, you’ll soon be experiencing the very best of wintry entertainment. Imagine snowmobiling through an undisturbed landscape of white, rocketing up to the top of splendid Lampivaara Fell. Here you’ll get to look around the famed mine and have the opportunity to dig for amethysts. This is a real hit with children, and the saying goes that if what you find fits inside a closed fist, it’s yours to keep! Ice-fishing gives a similar kick – it’s a hallowed sport in these parts, and making a catch is super-exciting! 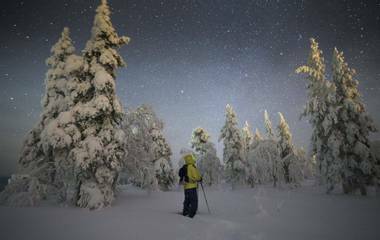 Snowmobiles are a fantastic means of chasing the Northern Lights, while a more relaxed option is to put on snowshoes and gently trek in search of these night-time marvels. Just as gentle is a reindeer sleigh ride, bringing a sprinkling of Christmas feelings with it – you’ll also get to visit a reindeer park and learn about how these animals are herded. Speedier alternatives include slipping over cross-country skiing routes and dog sledding. Husky rides are thundering good fun and are often the highlight of many holidays! Luosto is rightly celebrated for its skiing environment. We strongly encourage you to leave the limits of standard slopes behind and try your hand at cross-country skiing. Picking up the art from a dedicated instructor, you’ll be let loose on one of the many trails in the area. Never fear: the right ones will be chosen to suit your abilities. Dashing around, you’ll soon be putting the locals to shame. You’ll also find yourselves connecting with the nature that surrounds – certainly not something you fully feel on a normal piste. On the subject of nature, considering Luosto’s position near national park territory, safaris are must-try activities which will plunge you into white wonderlands. Keep an eye out for hidden wildlife among the trees and listen out for the spirit of the wild. You’ll be transported through time and space when you step into the Lampivaara Amethyst Mine – awed by the geological age of the place. Best of all, digging your own is incredibly rewarding and makes for a rather special souvenir, knowing the effort that went into it!